California Roundtable on Water and Food Supply Recommendations to shift thinking and spur appropriate action to balance the water needs of both farms and aquatic ecosystems. The agricultural use of water in a manner that optimizes agricultural water use while addressing the co-benefits of water for food production, the environment, and human health. 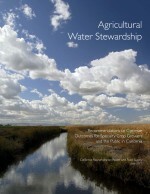 Agricultural water stewardship is premised on the notion that water management decisions cannot be made in isolation of the ecological, social, and economic context. It emphasizes whole-farm, place-based approaches that recognize the role of agriculture in the local watershed, and of local biogeographical conditions such as soil type, soil ecology, topography, and terrestrial and aquatic ecology in water management decisions. Nearly a quarter of farmers surveyed by the Agricultural Water Management Council said that lack of technical assistance limited their ability to implement water conservation practices. Omni Enviro Water Systems offers free information on how the H2O Energizer can be beneficial to your Farm, as well as Home and Garden. Magnetized water: Universal Source of Health? Research carried out by NASA has demonstrated that astronauts who are cut off from the earth’s magnetic field develop significant health problems which can be prevented by providing an artificial magnetic field within the space capsule (1,2). Do you suffer from a magnetic deficiency? The answer could well be “yes” unless you are already taking special precautions to avoid it. The earth’s magnetic field is declining steadily and has lost over 30 per cent of its strength over the last 2000 years. Some scientists believe the decline is accelerating and that we may be headed for a complete reversal where the magnetic North pole will be situated at the geographic South pole instead of at the geographic North pole as is currently the case. Magnetic field reversals take place only very rarely. The last one happened about 780,000 years ago so we don’t know what the effects of a reversal would be. We do know that once the reversal process starts it can proceed relatively quickly and be completed in as little as 2000 years (3,4). Human beings have no doubt adapted to a certain strength of the earth’s magnetic field. At the moment this strength is declining at a rate which may exceed our capacity to cope. Add to that the fact that we, to an increasing degree, encase ourselves in steel or reinforced concrete buildings, cars, subways and many other “cages” which essentially screen out the already weakened magnetic field and the stage could well be set for a massive dose of magnetic deficiency syndrome (1). The human body is profoundly responsive to electromagnetic fields. MRI (magnetic resonance imaging) is a powerful medical diagnostic technique which uses magnetic fields to distinguish between healthy and diseased tissues. Treatment with pulsed electromagnets (pulsars) has been found highly effective in curing or alleviating conditions such as bone fractures, migraine headaches, insomnia and depression. Pads and mattresses with built-in magnets are used to alleviate insomnia, rheumatic pain, migraines and circulatory problems. Says Dr. Wolfgang Ludwig ScD PhD of the Institute for Biophysics in Horb, Germany “Magnetic field therapy is a method that penetrates the whole human body and can treat every organ without chemical side effects” (1,5-8). The effects of the North pole (negative) and South pole (positive) magnetism are quite different. North polarity stabilizes, calms and sedates and also reduces pain, infection and inflammation. South polarity, on the other hand, is acid producing, enervating, biologically disorganizing and may accelerate bacteria growth. Magnets with a South polarity should only be used under the care of a trained practitioner if at all (1,6). The fact that our bodies consist mainly of water and that all our bodily processes are heavily dependent on water has lead to research into the possibility of using magnetized water to promote health and treat disease. For those of us who associate magnetism with intricate patterns of iron filings between the poles of a magnet the idea that water can be magnetized sounds pretty far out. However, there is ample evidence that magnetizing water either with permanent magnets or with electromagnets actuallly has a profound effect. The first practical application of water magnetization occurred in the 1950′s when engineers discovered that magnetically treated water had a greatly reduced tendency to form scale when heated. Several explanations for this have been advanced. The most plausible being that magnetization breaks up the “clusters” of water which surround lime and other “foreign” molecules. By doing so these molecules get the opportunity to crystallize and be carried along in the water rather than deposit themselves on the walls of the pipes. Although this explanation has many proponents it does not fully explain why magnetized water also dissolves old scale deposits (9-12). Magnetized water has also been found useful in the treatment of swimming pool water. Researchers at the University of Cranfield in the UK recently discovered that they could reduce the amount of chlorine needed to kill bacteria in a pool by 30 percent by clamping magnets on the water supply line. Dr. Klaus Kronenberg, a professor at the California State Polytechnic University, has found that the use of magnetized swimming pool water essentially eliminates the deposits formed where the top surface of the water meets the sides of the pool (13-15). Researchers at the Medical University of South Carolina recently reported that cleaning the teeth with water from a magnetized irrigator can reduce calculus formation by over 60 percent and improve overall gum health (16). Israeli agricultural researchers found that the use of magnetized water increased farm yields by anywhere from 5 to 20 percent. Cows drinking magnetized water produced more milk and were healthier than cows drinking untreated water. Sheep produced more wool and meat, hens laid more eggs and all farm animals survived longer when drinking magnetized water (9,10,17). Anecdotal evidence of the health benefits of magnetized water abounds. Magnetized water is claimed to be energy-building, activating, cleansing and detoxifying. There are reports of people resolving bladder problems, recovering quickly from a stroke, alleviating arthritis pain and reducing blood pressure by drinking magnetized water. It is perhaps reasonable to assume that if scientific studies on animals have proven that magnetized water has health benefits, then it should also be beneficial to humans. However, so far there have been no systematic, clinical trials done to prove or disprove the healing effects of magnetized water in humans (1,17,18). The vitalizing and healing properties of magnetized water are believed to be intimately tied in with its “memory”. Fresh, “virgin” water from a mountain stream is full of vitality especially if it has flowed over volcanic rock which is highly paramagnetic. During its passage through contaminated soil, miles of iron or plastic pipe, and treatment plants where it is exposed to toxic chemicals it loses its vitality. By the time it comes out of the tap it is essentially lifeless. Some researchers believe that the average city tap water may actually be harmful, not only because of its content of toxins, but also because it has developed a polarity which is harmful to our health. Other researchers suggest that the degradation of our tap water can bring its vitality lower than the vitality of the human body, resulting in feeling drained and tired after a shower or bath (9,17,19). Fortunately, recent research has shown that it is possible to regenerate water to its original healthy state by magnetizing it. It is now clear that water has a very definite structure. A water molecule consists of two hydrogen atoms and an oxygen atom. Because of the electron configuration of the molecule the hydrogen atoms tend to attract other water molecules resulting in the formation of clusters which can contain anywhere from four to hundreds of water molecules each. Some very exciting research done in Hungary has shown that these clusters actually have a memory and can remember and carry an imprint of the magnetic energy they have been exposed to either simply from the earth’s magnetic field or through flowing over paramagnetic rock. It is the fact that this memory is devastated on the way to the tap which renders our drinking water lifeless (9,19-22). Water can be re-magnetized by passing it through pipes which have permanent or electromagnets attached to them or by leaving water on top of a magnet overnight. The magnets must be carefully designed to match the water’s flow rate and should always be placed as close as possible to the outlet after other treatment units and filters. In stationary (overnight) magnetization it is important to ensure that only negatively polarized water or mixed negative and positive water is used. Magnetized water is softer than tap water so magnetization can result in significant savings in detergent and soap use. It also helps prevent deposits on cutlery and glasses washed in a dish washer and can even make hair shinier. Johann Grander and Heinrich Antosch, both disciples of the “father of water magnetization”, Dr. Viktor Schauberger, have developed units which produce “living water”. The units first use violent vortex mixing in a special chamber to eliminate the water’s memory of pollutants, chlorine, etc. and then imprint a beneficial magnetic memory on the water before it exits the tap. The units are installed under the sink or on the main water line and should always be situated after any other filters and treatment devices (9,17,18). A very recent development in magnetic water treatment involves the use of paramagnetic soil. Paramagnetic soil comes from volcanic rock which was permanently imprinted with the earth’s magnetic field just before it solidified. Paramagnetic rock and soil are not ferromagnetic (does not attract iron filings) but their magnetic dipoles are aligned in such a way that the soil or rock is strongly attracted to a regular magnet. Due to the age of the rock the “magnetic field” imbedded in it is often quite strong, considerably stronger than the earth’s magnetic field today. It is interesting that many holy sites and healing spas were built near paramagnetic rock formations. Perhaps our ancestors were able to feel directly the benefits of paramagnetism (19,23). The use of water treated by contact with paramagnetic soil is still in its infancy. However, agricultural experiments have clearly shown that both the paramagnetic soil itself (used as a fertilizer) and irrigation with paramagnetically treated water increase yields and plant vigour significantly (23). Anecdotal evidence of health benefits are emerging and inexpensive treatment equipment is being developed. A concerted effort is also being undertaken to develop reliable methods of actually measuring the effects of treating water either with magnets or paramagnetic soil. There is some indication that the UV (ultraviolet) spectrum of water is changed by magnetization and Dr. Thomas Narvaez, a researcher in Washington State, has successfully used radionics to measure the vitality of treated water. A clinical trial is in the planning stage to evaluate the benefits of magnetized water in the treatment of chronic fatigue syndrome (19,21,22,24-26). Magnetized water is truly emerging as one of the most exciting developments in the ongoing battle to protect our health.